OLLAS Charla Series " Nahua Codices: Writing and Re-writing Aztec History without Words"
The Observatory of Latinas/os in Nebraska's objective is to serve as a continuous source and analysis of information that can assist researchers, policy makers, and the community be informed and make informed decisions concerning a particular topic of relevance; April 16. UNO's Office of Latino/Latin American Studies (OLLAS) continues its OLLAS Charlas for the Spring 2019 semester on Tuesday, April 16 from 11:30 A.M. - 1 P.M. in the UNO MBSC Council Room, with a presentation from Dr. Christian Dona-Reveco, OLLAS Director and Associate Professor of Sociology, and Lizet Reyes-Nunez, M.S., OLLAS Graduate Research Assistant. The Observatory of Latinas/os in Nebraska's objective is to serve as a continuous source and analysis of information that can assist researchers, policy makers, and the community be informed and make informed decisions concerning a particular topic of relevance. In our first report, we documented and analyzed the presence and representation of Latinos in the Nebraska Press. We looked at themes, sources, and frames that have been present in the Omaha World Herald and the Lincoln Journal Star in 2017 and 2018. 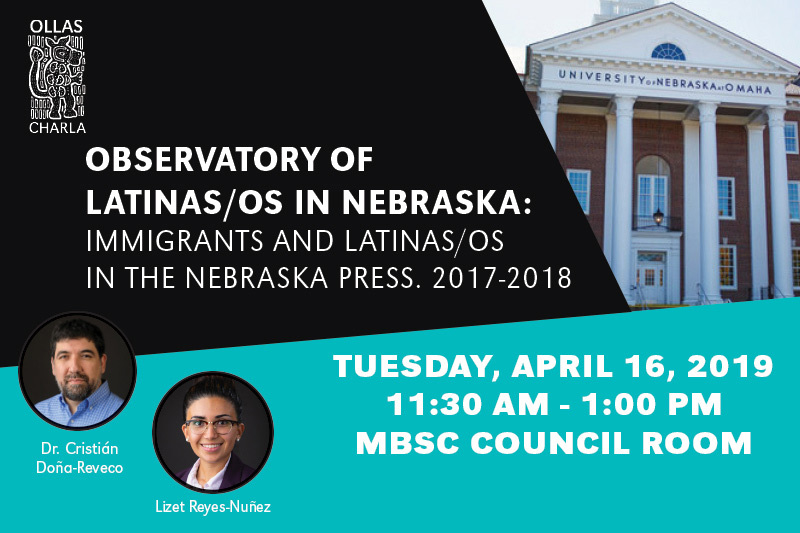 Using three keywords "Latinos", "undocumented/illegal", "immigration" we seek to explore the different conversations the media is proposing in relation to Latinas/os in Nebraska. This event is supported by The Sherwood Foundation and the UNO Department of Sociology & Anthropology. The name of the series, Charla, means "chat" in English. Established in 2003, the series was created to engage the UNO and greater Omaha community in informed and informal conversations about Latino and Latin American related issues. Each event in the series is free and open to the public.